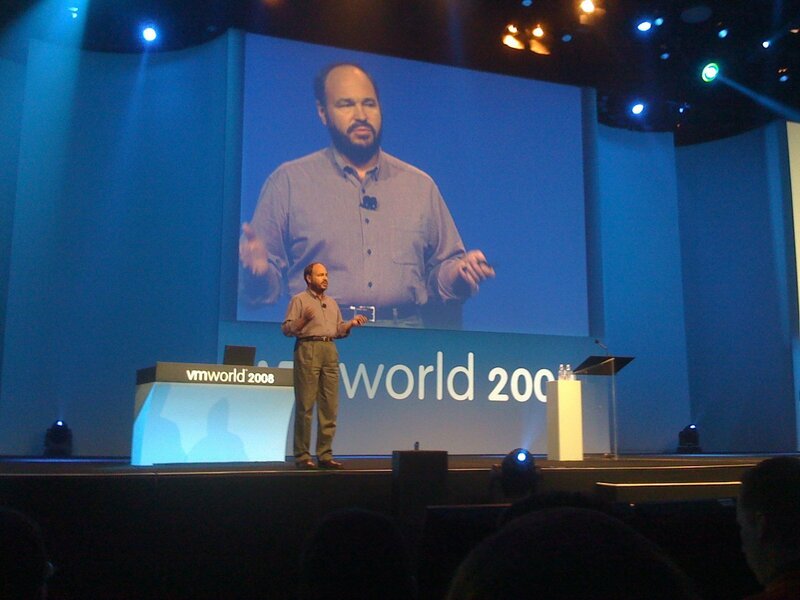 Following yesterday’s opening event, both the Technology Exchange and Partner Day, the conference started in earnest today with a keynote by Paul Maritz, VMware President and CEO. Paul is quite an articulate speaker, sounding both like a savvy businessman and an erudite professor. For many, his accent is difficult to place, is it Australian, South African? Turns out he was born in Zimbabwe, next door to South Africa, but he went to school in Cape Town, South Africa. Someone remarked that he pronounces some words like Sean Connery. Paul did work at University of St. Andrews in Scotland. Sean Connery grew up in nearby Edinburgh, Scotland. Back to the keynote, Paul amplified many of the concepts introduced and announced yesterday, specifically by drawing on the past to explain where VMware is going in the future. I found the history a good review of many of the events I’d witnessed in my own long career with computing, and a fascinating basis for describing where he sees the company going, as well as a foundation for the many announcements this week. How did he do this? He went back to the ’60s and ’70s (mainframes) and outlined the contrast between the Centralized vs. De-centralized models of computing. While he did not say so, the industry has swung between them several times over the last 30 years. He pointed out that we initially saw mainframes in the early days, and the proliferation of PCs in the ’80s. The early ’90s saw the rise of x86 Servers as well as the rise of the Client/Server model. He quipped that it’s ironic that he is now profiting from his previous sins in promoting the Client/Server model, which got us into a world of hurt so that we now seek another path, the best of both the Centralized and the De-centralized models. The advent of the Web in the mid-’90s offered the promise of this. He paid tribute to the founders of VMware, who started the company ten years ago back in 1998. He described VMware’s early efforts with both VMware Workstation (on the client, or De-centralized side in 1999) as well as the early VMware Server (GSX, on the Centralized side in 2000.) He pointed out that many other companies are currently virtualizing on the Centralized (server) side, but reminded us that VMware has done both sides, but raised the bar in 2004 with the introduction of VMware Infrastructure, a higher level of abstraction than either Server or Client side virtualization. At this point, I reflected that during my career I’d seen software engineers write to whatever the leading “platform” was at the time. In the ’80s it was Unix, and particularly SunOS (Solaris). The virtuous cycle had the platform supporting applications that led to more volume… which made the platform more viable. With the rise in popularity of Windows, it became the platform of choice. In the mid-’90s it was Java, with the promise of “Write Once, Run Anywhere” across a variety of devices. But last year, it became clear to me, especially following VMworld 2007 in San Francisco, that VMware was becoming the “platform”. Both the Press and the Analysts “got it,” and Wall Street saw a huge jump in VMware’s stock price following the ESXi announcement and others. So, what’s the new “platform”? Paul explained the Virtual Datacenter OS, or VDC-OS. It is a way to support a variety of current popular “platforms” line .Net, Windows, Linux, Java, Software As A Service… with Application vServices that provide Availability, Security, and Scalability. 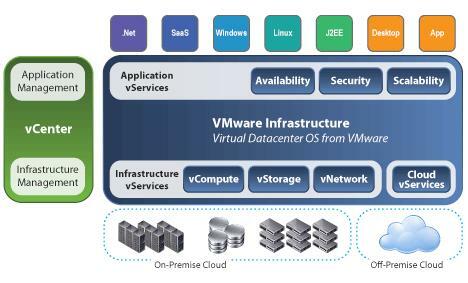 This rests upon Infrastructure vServices called vCompute, vStorage, and vNetwork… as well as Cloud vServices. These in turn live on either the On-premise cloud, or an Off-premise Cloud (for additional resources.) Meanwhile, all of this can be managed by vCenter (the rebranded Virtual Center management framework) which handles both Application Management at the top end and Infrastructure Management at the backend. To this end, many announcements fit into this new, higher level of abstraction. Once again, VMware raises the bar.